Do I really need 3 x v6 ? I was tempted by the Cactus solution because of the power control features. However I'm trying a setup using an LV5 now. I've tested the V6, one on the Nikon D810 and one with the SB-800, so far so good. I've then introduced the LV5. I've connected the V6 on the D810 to the cable release port and set it to RX. When the LV5 triggers both the shutter and the flash fire. However they are not sync. Looking at the manual, which isn't completely clear (to me at least) but it seems to suggest that I need a third V6. 1 V6 attached to the Flash set to RX & channel 2. Please confirm the correct setup. You hvae a couple ways of connecting your setuip. 3 V6 gives you the greatest flexibility - remote power control from the TX unit. 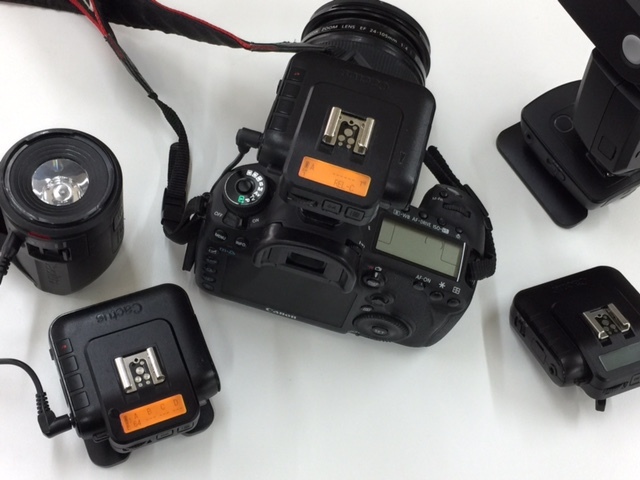 But you can get away with only 2 V6 units and you with the Relay Mode enabled - which allow you to save another unit for connecting to either the camera's shutter port or hot shoe. Another way of connecting the same gear is to use a Cactus V5 as a dedicate RX unit that connects to camera shutter port. Despite not using the Relay Mode, you don't need an extra sync cable. However your camera side would be more cluttered with two transceivers connected. Your notes about setting them to different channels is correct if you don't enable Relay Mode. Because the LV5 does not have a Relay Mode option, you can't trigger another V6 in Relay Mode. 1 V6 attached to the Flash set to RX (channel 2). 1 V6 attached to the D810 hot-shoe set to RX (channel 2), in relay mode, with a shutter release cable attached to the camera. The LV5 will trigger the V6 on the camera which will then automatically (and temporarily) switch to TX mode, firing the off-camera V6 (flash) when triggered by the camera's hot-shoe. Note that the LV5 needs to set to one channel setting lower (e.g., 1) than the rest of the triggers (e.g., 2). Only then will the LV5 trigger a V6 RX in relay mode. In order to remote control the power of the off-camera V6 (flash), you would have to change the on-camera V6 to TX mode, make power adjustments, and then turn it back to RX mode so that it continuous to work as a combined camera-trigger & flash trigger. Be sure to not use relay mode when the on-camera V6 is set to TX. The need to maintain different relay mode settings is no additional hurdle, though, as the relay modes for TX vs RX are managed separately so you don't have to configure back and forth. P.S. : You could even replace the off-camera V6 with a V5, if you don't need remote power control. But then you'd have to make sure to increase all channel numbers, because an LV5 on channel 1 would fire all V5 that are set to a channel within the range of 1-5. That would cause a premature firing of the off-camera V5. Thanks for your valuable feedback. I have to admit, I'd made plans to return the lot to the vendor until I read Class A's solution. I had previously tried setting the V6 on the camera to relay mode, but obviously I didn't have the right channels as the V6 just ignored the LV5. Now I'm not sure what to do! The multi function dial on the LV5 is just doing my head in and the suspicion that I needed two devices attached to my camera for a relatively simple and common requirement seemed ludicrous. But everything is now working as I had initially expected. But it has made me look in more detail at other solutions.... oh well. Thanks again for your assistance. It is appreciated. I am glad to hear it's working out for your setup! Yay!